Tricolor Garden Sage is a form of regular culinary Garden Sage and can be used in place of Garden Sage in any recipe. The irregular pattern of variegation in these leaves is stunning in the garden and is a worthy garnish for any poultry dish. Many a cooking magazine has featured their Thanksgiving Turkey platter adorned with either Tricolor Garden Sage or Golden Garden Sage. 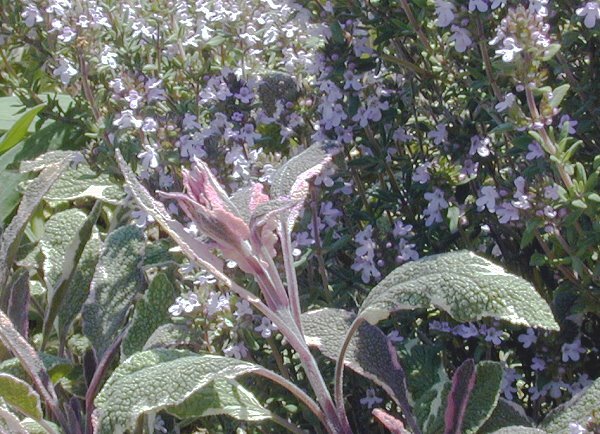 The brightly colored leaves of Tricolor Garden Sage complement many different combinations in the garden. 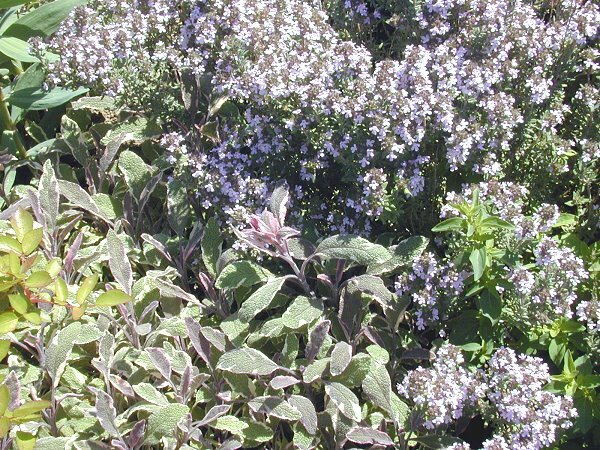 To the left, Tricolor Sage and Italian Oregano Thyme add splashes of color to an early spring garden. Try tucking it in the garden with the bluish purple flowers of Giant Catmint. This particular branch was actually going to flower. This is very rare for Tricolor Garden Sage. Most years we don't see any blooms at all which is OK because the leaves are so beautiful. The blooms will be the bright blue of regular Garden Sage. With Garden Sage there are so many flowers that a definite clean up is necessary after spring. With Tricolor Garden Sage no such labor is needed. 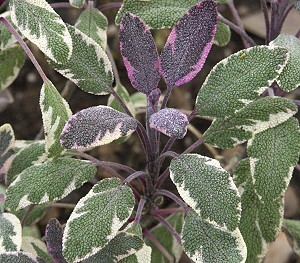 Tricolor Garden Sage leaves that receive insufficient amounts of sun do not develop the pink margins that you see above. These areas would be white. In the sun these areas color, kind of like a sunburn. A shady afternoon spot in areas that get very hot in the summer will help this sage from burning on the margins. While Garden Sages are generally water conserving, they look best and live longest when well hydrated in the summer. The photo above is a blow up of a small piece of the Tricolor Sage on the left. 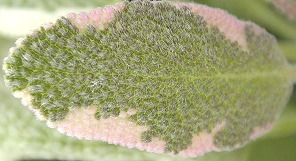 The fuzzy texture of each cell is typical of the Lamiaceae family to which all Salvias belong. 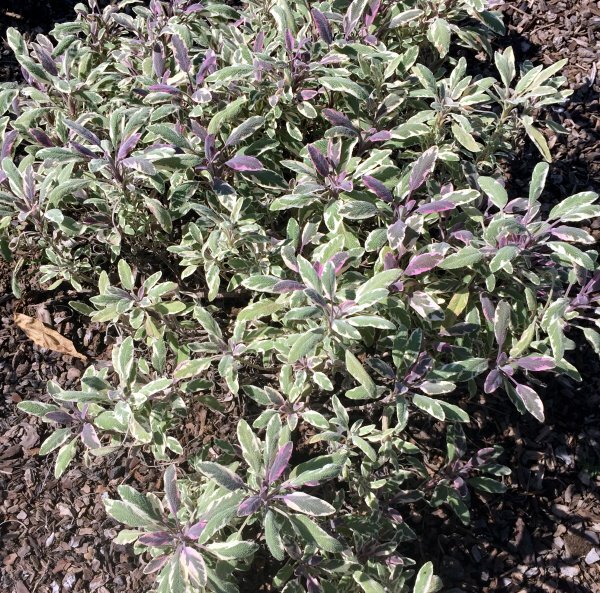 Tricolor Garden Sage would make a tasty addition to our Kitchen Herb Garden Six Pack or our Gourmet Herb Garden Six Pack. This plant is often available in plug trays. These trays hold 128 of all the same plant. They are a great low cost way to fill a lot of space. Each cell is 3/4 of inch by an inch. Check here to see if Tricolor Garden Sage Plug Trays are available.